Well, Pink was in our city last night for a concert, and while wifey and co were in the stadium watching it i went out and took some photos in front of our pink railway station. 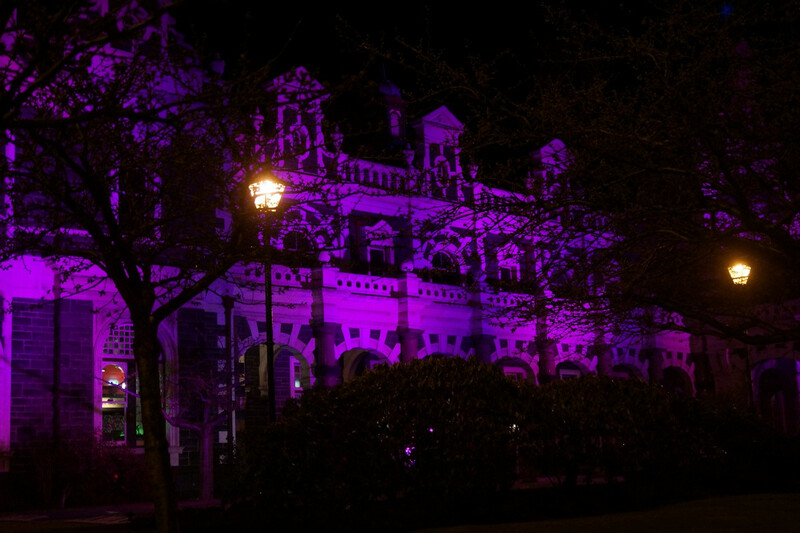 A lot of places around town used pink lighting to 'welcome' her to the city, like one of the motorway over bridges (which has LED lighting on either side as a display feature), the airport, city boundary signs, theatres, the Settlers Museum and so on. Camera was just on AUTO+ mode, as i couldn't be bothered taking a proper night pic. For a photo taken while reaching over to the passenger side window, with no real thought behind it, it turned out surprisingly good i think. Best pic of this i could find, but it's one of the 'welcome to Dunedin' roadside signs, likely between the airport and the city. When Ed Sheeran did three concerts here earlier this year the city did a similar thing, and changed signs like the above to say DunEDin. We get too excited when big names come here. Although they didn't do anything for Kendrick Lamar, Robbie Williams, Roger Waters who all came here this year too. Probably won't do anything for Shania Twain who's playing in a few months either. Last edited by SkylineObsession; September 1st, 2018 at 03:28 PM. SLM definitely takes some sweet pics these days... also noticed the sweet Danelectro Mr. Glittereyes is playing. Hi I'm still alive I just stopped posting on this forum and I'm not sure why. Here's one taken with the camera I hate to love and love to hate, the Sony A7 III. I know there is good in you. Let go of your hate and come back to the light. Thanks - dumb luck I think. What I'd seriously want for my car is outrageous. I've simply become attached to it, moreso than any car I've owned by a long shot. It's me. When I sit in it it's home. I imagine it could go for up to $20-25k on BaT if I were to throw it up there, but I have zero desire to. It'd take something ridiculous right now, like near six figures, for me to part with it. Which I know is insane. Funny you should mention it, I've mostly finished detailing it and need to take some new photos. It has never looked better. Look for them in my Garage thread in a couple days. Love the cat photos, and the sofa! Still here, still stealing the hell out of peoples' souls. Kinda threw this forum onto the pile of discarded relationships that I don't have the stamina or desire to maintain. Sold the A7 III because I was tired of its crap. Just spent $2100 on a very rare lens that I probably won't use much but it'll make me feel good to have it. The mysterious punk band "The Armed." One of only two performers I've seen where I've genuinely felt unsafe or uncomfortable being at the show. A friend of mine is the 4 year girlfriend of one of their members.